Welcome to the Hall Farm Nursery web site. Hall Farm Nursery is proud to be a Royal Horticultural Society Partnership Nursery. Our attractive and well maintained nursery is open to visitors throughout the season, from the beginning of March mid September - our hours of opening are shown on our next web page. 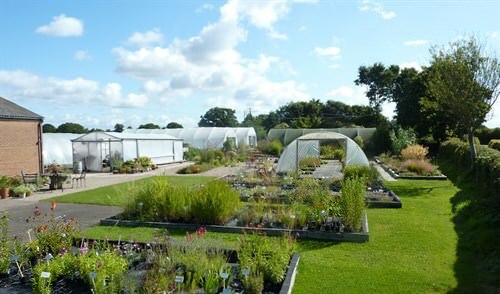 This is a traditional family run nursery and all our plants are propagated and grown on site. We grow hardy garden plants, border perennials, woodland plants, herbs and anything else which we fancy! We love and care for all the plants we grow. You can enjoy the unique garden-like atmosphere and see the plants growing in the display beds, borders and creative planters. The nursery is run on organic principles and the plants are all grown in our own high quality peat free compost. You will find more information about our compost on another page. When you visit you will be soon be aware that our emphasis is on high quality plants. We do all we can to help our environment, we recycle, use biological controls, we are peat free and we provide habitat for our local wildlife. Whether you are completely new to gardening or an avid plantsperson we are sure you will enjoy visiting Hall Farm Nursery.